If you had to eat just one food every day for the rest of your life, what would it be? That’s not a hard choice for me. This is it. Mix seasoning ingredients thoroughly. Rub onto all sides of the pork belly and place in a nonreactive dish or pan. Sprinkle any remaining dry rub on top of the meat (use all of rub). Cover and refrigerate for 8 hours or overnight. Heat oven to 325 degrees. 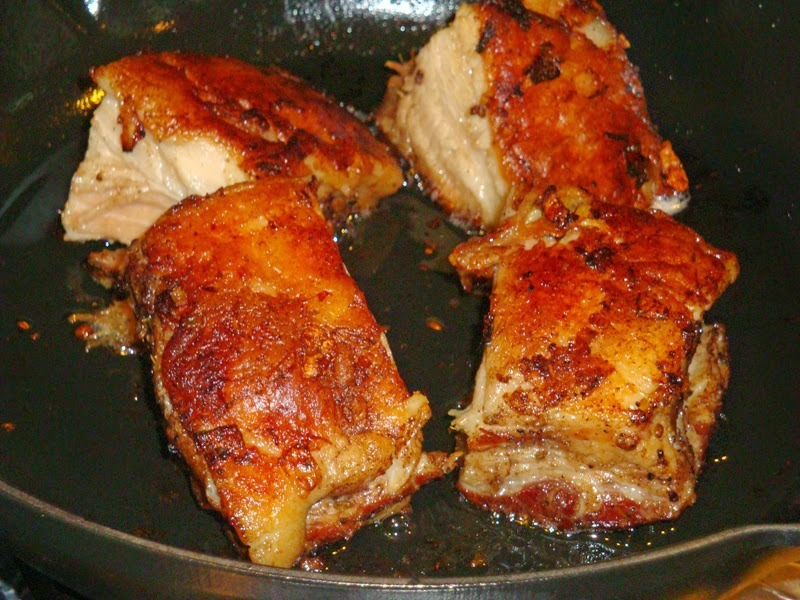 Remove pork from refrigerator and place in a roasting pan. In a large saucepan, saute onion, carrot, and celery in fat until soft, about 5 minutes. Add garlic and cook another 5 minutes. Add wine and cook until wine is evaporated. Add cinnamon stick, star anise, juniper berries, cardamom, clove, and chicken stock. Bring to a boil. Pour hot braising liquid over pork belly. Cover and place in oven. Cook 3 ½ hours or until completely tender when pierced with a fork. Note: The pork belly can be prepared up to this point and refrigerated in the cooking liquid until ready to proceed. Remove the belly from the braising liquid and cool. Discard liquid or reserve for cooking vegetables to accompany pork belly (Brussels sprouts are nice). Heat oven to 400 degrees F. Cut belly into 4 portions. Place, fat-side-side-down, in a hot skillet with a a tablespoon of fat or oil and saute for 2 minutes. Return to oven to heat through, about 5 minutes. Finish warming in oven for 5 minutes. Recipe based on one by chef Donald Link of Cochon Restaurant in New Orleans, LA. Note: If even after all the recent news stories, anyone is still nervous about eating fat, do yourself a favor and read The Big Fat Surprise; Why Butter, Meat and Cheese Belong in a Healthy Diet, by Nina Teicholz and Rejoice! Nina Teicholz, Pork Belly, Spices, The Big Fat Surprise. Bookmark. Sounds great and looks amazing but way too many ingredients and seems very time consuming for four small pieces of meat. I have this in the oven right now! 325 cooking; however, mine is 5 lbs. How long should I cook it? Thank you! and thank you for your blog and great recipes. Anonymous: It is probably too late to help this time, but I think it might be better to cut the pork belly into smaller pieces before cooking. The total weight won't matter then. I have pork belly strips. How should I adjust this recipe to work with those? It might work if you just left the slices stuck together and treated them like one piece. Or maybe you could put a skewer through them.